There is no national registration of companies in the USA. All businesses are registered at the county or state level. Listed below is how to register in Yexas. The state or counties will not check (or care) if your name conflicts with names of other businesses in other states! Sole Proprietorships and private partnerships are registered at the County level in Texas. This includes Fictitious Business Name statements (also known as “DBA”s). In most cases the fee is under $50 and anyone can register a business simply by visiting your county’s business office and completing the right paperwork. Corporations (both for-profit and non-profit), including C or S Corps, Limited Liability Partnerships (LLPs), and Limited Liability Corporations (LLC) are only valid when registered with the Secretary of State. NOTE: These notes are on registering the business only. You may also need a business license for any regulated businesses, and may also require city permits or licenses. These vary greatly from city to city. Trademarks: Texas does support its own trademarks. There is no way to designate a Texas only trademark, and most trademark professionals will advise you to use a Texas trademark only if you cannot get a federal registration and you will specifically be trading only in Texas. Save yourself time and money by having a full trademark search done first through a naming agency (like this one in this site) or through a low cost online legal service. If your trademark application is rejected, you will lose your filing fee. 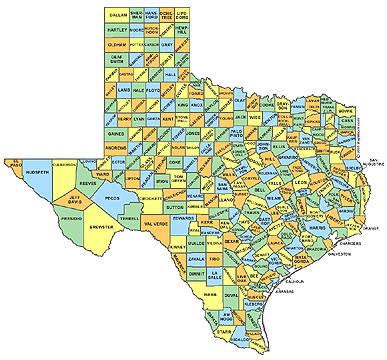 Sales Tax: In Texas, sales tax varies by county and city. If you will be selling taxable good or services (which is often the case unless you only sell to resellers), you will need to report this via the State Comptrollers Office. Largest Cities: Houston, Dallas, San Antonio, Austin, El Paso, Fort Worth, Arlington, Corpus Christi, Plano, Garlan. Brighter Naming provides full naming and trademark checking services to Texas which includes area codes 806, 915, 940, 325, 830, 210, 956, 361, 512, 254, 682, 817, 214, 469, 972, 903, 430, 936, 979, 409, 81, 346, 713, and 832. The name Texas is based on a word used by Caddo Indians meaning “friends”. It is known as The Lone Star State. Disclaimer: These are purely informational guidelines. For details in your particular case, please consult your lawyer, accountant or state/county office. Brighter Naming is not licensed to provide legal advice. The information here is provided as an informational service only.